Indonesia is a nation of more than 17,000 islands spanning the South Pacific and Indian Ocean along some of the world’s busiest sea routes. 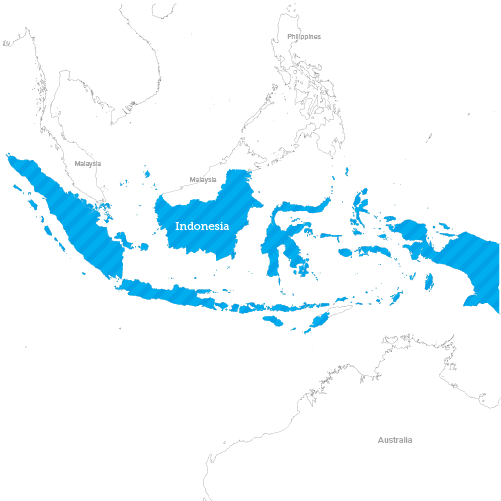 The Indonesian archipelago is highly active geologically, making it unusually vulnerable to earthquakes, tsunamis and volcanic eruptions. Indonesia suffered greater damage from the 2004 Indian Ocean tsunami than any other country. It also lost more lives, with an estimated 160,000 Indonesians among the more than 220,000 killed in the disaster. International Medical Corps currently is in Indonesia supporting response efforts following a series of powerful earthquakes that struck the Indonesian island of Sulawesi on September 28, 2018. The largest quake, a powerful magnitude 7.4, shook the region at 5:02 p.m. local time, triggering a tsunami that hit nearby coastlines, including the coastal city of Palu. Indonesia’s National Board of Disaster Management (BNPB) estimates that 2.4 million people were affected by the earthquake and tsunami. Many thousands of buildings collapsed or were subsumed, more than 2,200 people died, and almost 6,000 were severely injured or deemed missing. Needs for those affected by the disasters included shelter, clean water, food, fuel, medicines and medical personnel, and psychosocial support. Our emergency response team is in Palu and Jakarta working with our network of partner organizations and coordinating with on-the-ground actors, governments and other agencies to provide shelter, mental health services, and water, sanitation and hygiene services, among other response and recovery activities. Because of International Medical Corps’ deep experience in the country, we are able to quickly mobilize staff and assets across a range of sectors as priority needs are identified. For example, in Central Sulawesi, we are working with our local partners, KUN Humanity System and YKMI, to build shelters, latrines and furniture with local materials, including bamboo. The program involves community members who build these shelters—an aspect of the program that is critical for sustainability, because community members will thus learn the skills and how to obtain the materials needed to fix their shelters if they experience need after the program ends. The use of bamboo also is important because it dovetails with the government’s climate-change mitigation efforts, which aim to strengthen the capacity of local communities to get the most from this valuable, renewable resource. According to advocates, bamboo-based remediation efforts boost rural household incomes while protecting natural resources. In addition, we are working with the IBU Foundation on programs that provide psychosocial support, child protection, shelter and disaster management services. And, with partners KUN and YKMI, we are working to provide sources of clean water to villages throughout the region, along with hygiene and sanitation resources. The destruction caused by the earthquake and tsunami that hit the Indonesian island of Sulawesi in September 2018 was widespread, extending for miles inland. We are working closely with our partner KUN Humanity System to distribute supplies to people affected by the disaster. ...but sometimes the widespread damage caused by the earthquake and tsunami makes transportation of supplies a challenge. We quickly set up healthcare centers to help meet the needs of local communities. Yogi Mahendra, our country lead in Indonesia, helps lay a foundation for a new series of shelters in Donggala Regency, Indonesia. We worked quickly with local partners and members of the communities to build shelters, to help protect residents from the elements—and the threat of additional disasters. Many displaced people have been living in makeshift tarpaulin tents, often held in place by only wooden poles and ropes. Yogi Mahendra, our country lead in Indonesia, helps get the shelters ready for occupants. Some structures are made of bamboo, a local material that is easy for local residents to find and work with, helping to build livelihoods—and resilience. Our emergency response team was quickly on the ground in Indonesia to support response efforts following a series of powerful earthquakes and the resulting tsunami that struck the Indonesian island of Sulawesi on September 28, 2018. Three months after a powerful magnitude 7.4 earthquake caused a tsunami that struck Indonesia’s Sulawesi island, our emergency response team was quickly on the ground in Indonesia to support response efforts following the tsunami that struck December 2018.